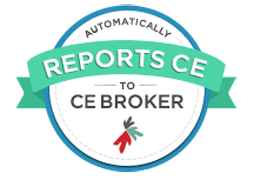 We report your professional course completions to CE Broker daily. If you are licensed in a state monitored by CE Broker, we report your course completions daily. Completions are reported only by license number, so please make sure you enter your license number correctly, usually beginning with letters, followed by the numbers. There are not usually spaces, zeros or dashes between the letters and numbers. Established in 1979, Consultants for the Future has become a leader in quality continuing education for healthcare professionals for over 25 years. For those licensed in states monitored by CE Broker, we report your completion to CE Broker every morning.